A (very) prerelease version 1.05, available via SVN or as a ZIP archive. TOmniQueue (existing class TOmniQueue was renamed to TOmniBoundedQueue) is a dynamically allocated, O(1) enqueue and dequeue, threadsafe, microlocking queue. The emphasys is on dynamically allocated. In other words – it grows and shrinks! TOmniBlockingCollection is a partial clone (with some enhancements) of .NET’s BlockingCollection. Have fun and happy new year to all Delphi programmers! Delphi 2010 Update 2/3 broke OmniThreadLibrary, but as this update was revoked, I didn’t look into the problem at all. Now that Update 4/5 is out and OTL is still broken I had no choice but to fix it. Luckily for me, ahwux did most of the work in detecting the problem and providing (at least partial) fix. OTL is written without resorting to ugly hacks (at least whenever possible). So what could they do to break my code? OTL uses RTTI information to implement ‘call by name’ mechanism. And that’s not the basic RTTI, implemented in TypInfo unit, but extended class-RTTI from ObjAuto. [In case you want to take a peek at the code – the relevant bits can be found in method TOmniTaskExecutor.GetMethodAddrAndSignature inside the OtlTaskControl unit.] The code checks the method signature (number of parameters, their types and the way they are passed to the method) to see if it matches one of three supported signatures. For example, first parameter must be the Self object and the code checked this by testing (params^.Flags = ) and (paramType^.Kind = tkClass). This worked in Delphi 2007, 2009, and 2010 – but only in the original release and Update 1. Starting with the Update 2, params^.Flags equals [pfAddress] in this case. Similarly, constant parameters had flags [pfVar] up to D2010 Update 1 while this changed to [pfConst, pfReference] in D2010 Update 2. If anybody from Embarcadero is reading this: Could you please refrain from doing such changes in IDE updates? Thanks in advance. Oh, I almost forgot – OTL 1.04b is available on the Google Code. This release fixes nasty bug (introduced in release 1.51) which caused various TDSiRegistry function (and other DSi code using those functions) to fail on Delphi 2009/2010. Added parameter 'access' to the DSiKillRegistry. [Mitja] Fixed allocation in DSiGetUserName. [Mitja] Also catch 'error' output in DSiExecuteAndCapture. Added DSiAddApplicationToFirewallExceptionListAdvanced which uses Advanced Firewall interface, available on Vista+. DSiAddApplicationToFirewallExceptionList now calls either DSiAddApplicationToFirewallExceptionListXP or DSiAddApplicationToFirewallExceptionListAdvanced, depending on OS version. Implemented functions to remove application from the firewall exception list: DSiRemoveApplicationFromFirewallExceptionList, DSiRemoveApplicationFromFirewallExceptionListAdvanced, DSiRemoveApplicationFromFirewallExceptionListXP. This minor release was released mostly because of exception handling problems when thread pool was used in version 1.04. 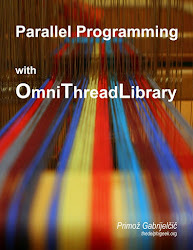 If you’re using thread pool feature and have OTL 1.04 installed, I’d strongly urge you to upgrade. Besides code fix I sneaked in a small API upgrade. IOmniTask interface now defines methods RegisterWaitObject/UnregisterWaitObject which the task can use to wait on any waitable object when using TOmniWorker approach (no main thread loop). There’s also a new demo application 31_WaitableObjects which demonstrates the use of this feature. Pop quiz. What’s wrong with this code? Looks fine, but it doesn’t work. In most cases, running this code fragment would cause immediate access violation. This is a common problem amongst new OTL users. Heck, even I have fallen into this trap! The problem here is that CreateTask returns IOmniTaskControl interface, or task controller. This interface must be stored into some persistent location, or task controller would be destroyed immediately after Run is called (because the reference count would fall to 0). This works for background workers with long life span – for example if there’s a background thread running all the time the program itself is running. But what if you are starting a short-term background task? In this case you should monitor it with TOmniEventMonitor and cleanup task controller reference in OnTerminate event handler. As it turns out, event monitor keeps task controller interface stored in its own list, which will also keep the task controller alive. That’s why the following code also works. Since OTL v1.04 you have another possibility – write a method to free the task controller and pass it to the OnTerminated. If you’re using Delphi 2009 or 2010, you can put the cleanup code in anonymous method. OnTerminated does its magic by hooking task controller into internal event monitor. Therefore, you can get real tricky and just write “null” OnTerminated. As that looks quite ugly, I’ve added method Unobserved just few days before version 1.04 was released. This method does essentially the same as the “null” OnTerminated approach, except that the code looks nicer and programmers intentions are more clearly expressed. Stable release is out! Get it while it’s still hot! Bugfixes in the thread pool code. D2009 packages and test project group updated (thanks to mghie). New since 1.03: read full list. I’ve released OTL 1.04 beta, which is functionally the same as the alpha release but contains some bug fixes. You can download it from Google Code. 1.04 final will be released on 2009-11-23, i.e. next Monday. Changed semantics in comm event notifications! When you get the 'new message' event, read all messages from the queue in a loop! Message is passed to the TOmniEventMonitor.OnTaskMessage handler. There's no need to read from Comm queue in the handler. Exceptions in tasks are now visible by default. To hide them, use IOmniTaskControl.SilentExceptions. Test 13_Exceptions was improved to demonstrate this behaviour. Default communication queue size reduced to 1000 messages. Support for 'wait and send' in IOmniCommunicationEndpoint.SendWait. Communication subsystem implements observer pattern. WideStrings can be send over the communication channel. New event TOmniEventMonitor.OnTaskUndeliveredMessage is called after the task is terminated for all messages still waiting in the message queue. Implemented automatic event monitor with methods IOmniTaskControl.OnMessage and OnTerminated. Both support 'procedure of object' and 'reference to procedure' parameters. New unit OtlSync contains (old) TOmniCS and IOmniCriticalSection together with (new) OmniMREW - very simple and extremely fast multi-reader-exclusive-writer - and atomic CompareAndSwap functions. New unit OtlHooks contains API that can be used by external libraries to hook into OTL thread creation/destruction process and into exception chain. 25_WaitableComm: Demo for ReceiveWait and SendWait. 26_MultiEventMonitor: How to run multiple event monitors in parallel. 28_Hooks: Demo for the new hook system. 29_ImplicitEventMonitor: Demo for OnMessage and OnTerminated, named method approach. 30_AnonymousEventMonitor: Demo for OnMessage and OnTerminated, anonymous method approach. And now I can’t get it out of my head. Should there be delphioverflow.com? What could we get out of it? I would be the first to admit that the StackOverflow model is greatest thing since Belgian waffles and that having Delphi questions and answers in such form would be very useful. But wait – there already are Delphi questions on StackOverflow! Not that many as C# questions, but still enough that Delphi is seen on the front page and that other users can read about it and see that it is alive and well. Even more – there are enough knowledgeable Delphi programmers on SO and most questions get great answers in less than five minutes. What other positive result could such site bring? Maybe Embarcadero people would be more eager to participate and answer questions on their own server? Maybe, but not sure. Delphi R&D team is very busy and sometimes they can’t even find time to answer newsgroup questions. And I’m pretty sure that - whatever such change would bring – newsgroups wouldn’t go away. Let’s take a look from another perspective. What would be negative consequences? Less Delphi questions on StackOverflow. And that’s a Bad Thing because it lowers Delphi’s discoverability. We want to talk about Delphi in public places, not on some secluded server! Now I know how to answer. No, I don’t think we need DelphiOverflow. We need more Delphi R&D people answering questions on StackOverflow. There is only one big change in the latest GpHugeFile – read prefetch. Most people won’t need it at all and other will only need it occasionally, but for some people, sometimes, it will be a life saver. The prefetch option is only useful when you read a file mostly sequentially from a relatively slow media. Useless? You never did that before? Did you ever played a video file from the network server or from the YouTube? Well, there you are! Playing video files (especially HD) over network is not a trivial task. In some occasions (namely, slow networks or high bitrate files) the network speed is only slightly above the minimum required for the seamless video playout. Even more – the network speed is not constant because you share it with other users and at some times it may not be high enough to play the video without stuttering. To solve this problem, video players use prefetch (or read-ahead) – they will read more data than required and use this buffer when the network slows down. Better said – video will always play from this buffer but the buffer size will vary depending on current network speed. So how’s this typically done? One way is with a background thread that sequentially reads through the file and buffers the data and another is with asynchronous read operations. This very powerful approach is part of the standard ReadFileEx Win32 API and is relatively easy to use – you just start the read operation and some time later the system will notify you that the data is available. There are some problems, though, the biggest of them the requirement that your reading thread must be in a special alertable sleep state for this notification to occur. The third option is not to use threads or asynch file ops, but to pass hfoPrefetch and hfoBuffered flags to the ResetEx. In the same call you can also set the number of prefetched buffers. As for the buffer size – it is also settable with a ResetEx parameters and will be rounded up to the next multiplier of the system page size (async file io requirement) or it will be set to 64 KB if you leave the parameter at 0. When you se hfoPrefetch, TGpHugeFile will create background thread and this thread will issue asynchronous file io calls. Prefetched data is stored in a cache which is shared between the worker thread and the owner. Unfortunately for some, this option is only available in Delphi 2007 and newer because the worker object is implemented using OmniThreadLibrary. Maybe you’ll wonder why the thread is not issuing normal synchronous reads? For two reasons – I didn’t want the thread to block reading data when owner executes a Seek (file repositioning will immediately tell the prefetcher that it should start reading from a different file offset) and I wanted to issue multiple read commands at the same time (namely 2). Today I finally published all my updated open source units. Some were recently modified and for others the update was long overdue. Some were only slightly modified, in others the changes were bigger. Read through the list below and you’ll see. In future posts I intend to write some more about changes in GpHugeFile, GpStuff, and GpLists. If you want to know more about changes in other units, drop a comment. Implemented read prefetch, activated by setting hfoPrefetch option flag. Number of buffers to prefetch can be set with a ResetEx parameter. Unfortunately for some, this option is only available in Delphi 2007 and newer because the worker object is implemented using OmniThreadLibrary. Extended IVersion interface with IsNotHigherThan, IsNotLowerThan and IsEqualTo. Added internal check to ensure that TGpSWMR.WaitToRead/WaitToWrite/Done are called from one thread only. Added EnumPairs string array enumerator. InterlockedIncrement/InterlockedDecrement deal with integers, therefore TGp4AlignedInt.Increment/Decrement must return integers. All other functions in TGp4AlignedInt also changed to work with integers. Implemented function CAS (compare and swap) in TGp4AlignedInt and TGp8AlignedInt64 records. TGp8AlignedInt.Addr must be PInt64, not PCardinal. [Erik Berry] Definition of fmCreate in Delphi 2010 has changed and code had to be adjusted. Added setter for TGpFixedMemoryStream.Position so that invalid positions raise exception. Added parameter 'step' to various Slice(), Walk() and WalkKV() enumerators. Added method FreeObjects to the TStringList helper. Daniel R. Wolf of the Delphi PRAXiS. Not the official Spirit of Delphi award, but the Delphi Legends Community Award in the organization of Wings of Wind (who are those people???). Anyway, somehow I got nominated and even scrapped together the fifth place, which is definitely more than I deserve, but still – thanks for the recognition, folks! The code unit, OmniXML.pas, which contains the XML representation interfaces, parser and writer, was written by a single programmer, Miha Remec (he is also the guy behind the www.omnixml.com website). He started writing it in 2000, because he was missing a native Delphi DOM parser, one that would represent the DOM the same way as it was designed. The best Delphi parser around at that time was OpenXML, but it used classes to represent XML elements, not interfaces. OmniXML uses interfaces, derived from the IXMLNode (as specified by the DOM). That also makes it almost completely compatible with the MSXML parser, which uses the same approach. In the 2004 May issue I wrote about OmniXML, a native Delphi XML parser. I described the OmniXML approach and wrote few short pieces of code that demonstrated its use. Today, five years later, OmniXML is still strong and I’m still using it, as you can see in my Fluent XML series. Links: article (PDF, 45 KB), source code (ZIP, 795 KB). It’s been some time since I’ve last updated my open source units… For example, DSiWin32, a collection of Win32 API helpers, was last updated in August 2008! Bad me! Time to do some housecleaning, then. Let’s see what’s new in DSiWin32 1.51. Function DSiGetGlobalMemoryStatus is not much more than a wrapper to the GlobalMemoryStatusEx API and returns information about global memory status (paging, virtual memory etc). Information is returned in a TMemoryStatusEx record, which is also defined in the DSiWin32 unit. We implemented six new function in the files section. DSiGetNetworkResource converts drive letter (created by mapping network location) back to the network path. DSiDisconnectFromNetworkResource disconnects drive letter from a network resource. [DSiConnectToNetworkResource was included in the previous public version 1.41.] DSiGetSubstDrive maps drive letter (created by using Subst command) to the associated folder and DSiGetSubstPath does similar for a file path that starts with a subst’ed letter. DSiDisableWow64FsRedirection disables file system redirection (mapping from \Windows\System32 to \Windows\SysWOW64 for 32-bit applications on 64-bit systems) for the current thread and DSiRevertWow64FsRedirection reverts this change. There are also two new install functions. DSiAddApplicationToFirewallExceptionList adds application to the firewall exception list and DSiAddPortToFirewallExceptionList does the same for a TCP/IP port. DSiGetWindowsVersion was extended to detect Windows Server 2008, Windows 7 and Windows Server 2008 R2. DSiGetTrueWindowsVersion was also upgraded to return “Windows Server 2008 or Vista SP1” and “Windows 7 or Server 2008 R2”. It looks like it is not possible to discriminate between those operating systems on the API level :( Record TOSVersionInfoEx was also defined as it was used in the DSiGetWindowsVersion. 'Access' parameter was added to the DSiWriteRegistry methods so that user can request writing to the non-virtualized key when running on 64-bit system (KEY_WOW64_64KEY). DSiExecuteAndCapture got much deserved workover. Now the caller can be informed of each line outputted by the child process. Delphi 2009/2010 compatibility was fixed for DSiGetFolderLocation, DSiGetNetworkResource, DSiGetComputerName, DSiGetWindowsFolder, DSiExecuteAndCapture and bugs were fixed in DSiGetTempFileName and DSiGetUserName. Memo to self: When you play with computer vision next time, check the OpenCV library. Found via IPhone Sudoku Grab via Julian M Bucknall. Apparently there is no Delphi interface (yet) but as the DLL has simple C interface, such interface could easily (or “easily”?) be implemented. I’m fully aware that I was silent for a long long time. That’s how life goes. Sometimes you have time to think and write and sometimes software has bugs, children are growing, house is telling you that it shouldn’t be in the “fixer-upper” mode anymore and the body starts warning that the guaranty has expired. Plus the days suddenly have only 24 hours and not 28 as it was customary for the last ten years. In short – I had no time. Life was going on. And around. And over me. Especially over me. Luckily, everything is turning out fine and I will again write about my Delphi adventures. There were also T-shirts and I was lucky to get one. Nice T-shirt but it’s even better if you look closer at the code. Parallel Erathostenes sieve! That’s definitely the code I can appreciate! Now we can already guess where the general sluggishness of the shared event system comes from. The trouble lies in the constant XML loading and saving. Most of the shared event system tables are quite static, but that doesn’t hold for the Event Queue table, where new entries are inserted, modified and deleted all the time. My second article on shared events architecture first addressed speed issues (original code was quite slow), then discussed internals of shared counters, shared linked lists and shared tables (all of which are used in the shared events system) and at the end returned to fine-tuning by fixing some remaining speed issues. As you can expect, the basis for the tuning was hard data from the profiler, not some wave-of-hand ideas about where the problem maybe lies. Links: article (PDF, 99 KB), source code (ZIP, 1,9 MB), current version. Shared event system, as I nicknamed this approach, is implemented as a shared set of in-memory tables, which are accessed and manipulated by producers and listeners. The important part is that there is no dedicated server: housekeeping is distributed between the producers and listeners. Shared events mechanism was definitely the most complicated architecture based on shared memory I ever put together. The system allowed multiple programs (running on the same computer) to cooperate using an event-based system. First program would publish an event (or more events) and others would subscribe to those events. First program would then broadcast the event, which would trigger notifications in all subscribed programs. The best trick was that there was no privileged part – no server, service or manager. Publishers and consumers shared all the work – tables were created as needed, housekeeping was done on both sides and so on. Underlying architecture was largely redesigned after this article was published. Original source files are included only for historical reference. Links: article (PDF, 496 KB), source code (ZIP, 1,9 MB), current version. Yesterday I described my approach to more fluent XML writing. Today I’ll describe the GpFluentXML unit where the ‘fluid’ implementation is stored. If you skipped yesterday’s post you’re strongly encourage to read it now. Let’s start with the current version of the fluent XML builder interface, which is not completely identical to the yesterday’s version. The fluent XML builder is designed around the concept of the active node, which represents the point where changes are made. When you call the factory function CreateFluentXml, it creates a new IXMLDocument interface and sets active node to this interface (IXMLDocument is IXMLNode so that is not a problem). When you call other functions, active node may change or it may not, depending on a function. AddProcessingInstruction and AddComment just create a processing instruction (<?xml … ?> line at the beginning of the XML document) and comment and don’t affect the active node. AddChild creates a new XML node and makes it a child of the current active node. Up sets active node to the parent of the active node. Unless, of course, if active node is already at the topmost level in which case it will raise an exception. In the yesterday post this method was called Parent. AddSibling creates a new XML node and makes it a child of the current active node’s parent. In other words, AddSibling is a shorter version of Up followed by the AddChild. SetAttrib or it’s shorthand, the default property Attrib, sets value of an attribute. Mark and Return are always used in pairs. Mark pushes active node on the top of the internal (to the xml builder) stack. Return pops a node from the top of the stack and sets it as the active node. Yesterday this pair was named Here/Back. Anchor copies the active node into its parameter. That allows you to generate the template code with the fluent xml and store few nodes for later use. Then you can use those nodes to insert programmatically generated XML at those points. At the end, there’s the Xml property which returns the internal IXMLDocument interface, the one that was created in the CreateFluentXml. And now let’s move to the implementation. Class TGpFluentXmlBuilder implements the IGpFluentXmlBuilder interface. In addition to the methods from this interface, it declares function ActiveNode and three fields – fxbActiveNode stores the active node, fxbMarkedNodes is a stack of nodes stored with the Mark method and fxbXmlDoc is the XML document. In fact Up is also very simple, except that it checks validity of the active node before returning its parent. A little more trickstery is hidden inside the ActiveNode helper function. It returns active node when it is set; if not it returns XML document’s document element or the XML doc itself if document element is not set. I don’t think the second option (document element) can ever occur. That part is just there to future-proof the code. Believe it or not, that’s all. The whole GpFluentXml unit with comments and everything is only 177 lines long. Few days ago I was writing a very boring piece of code that should generate some XML document. It was full of function calls that created nodes in the XML document and set attributes. Boooooring stuff. But even worse than that – the structure of the XML document was totally lost in the code. It was hard to tell which node is child of which and how it’s all structured. I started by writing the endcode. In other words, I started thinking about how I want to create this XML document at all. Quickly I decided on the fluent interface approach. I perused it in the OmniThreadLibrary where it proved to be quite useful. This short fragment looks quite nice but in the full version (about 50 lines) all those SetAttr calls visually merged together with AddChild calls and the result was still unreadable (although shorter than the original code with explicit calls to XML interface). Then I thought about arrays. In “classical” code I could easily add array-like support to attributes so that I could write xmlNode[attrName] := ‘some value’, but how can I make this conforming my fluent architecture? In order to be able to chain anything after the , the indexed property hiding behind must return Self, i.e. the same interface it is living in. And because I want to use attribute name/value pairs, this property has to have two indices. As you can see, attributes can be chained and I can write attribute assignment in the same line as node creation and it is still obvious which is which and who is who. But … assignment? In a getter? Why not! You can do anything in the property getter. To make this more obvious, my code calls this ‘getter’ SetAttrib. As a nice side effect, SetAttrib is completely the same as it was defined in the first draft and can even be used insted of the  approach. I’ll end today’s instalment with the complete 'fluent xml builder’ interface and with sample code that uses this interface to build an XML document. Tomorrow I’ll wrap things up by describing the interface and its implementation in all boring detail. What do you think? Does my approach make any sense?